Star Line Mackinac Island Ferry offers a unique opportunity to experience the Straits of Mackinac and Mackinac Island with our Sunset Cruise and Fireworks Cruises. NEW! 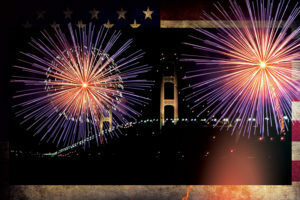 Enjoy our Fireworks Cruise out of St Ignace Main Dock every Saturday night July 8th – September 2nd departing at 9:30 pm in July and 9:00 pm in August and September. You are welcome to bring your own beverages. Children Under 5 Cruise for Free! 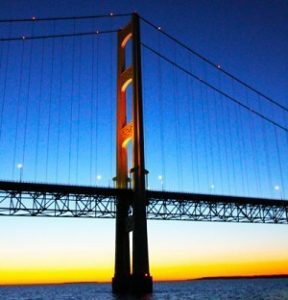 Take a one and a half hour Star Line Mackinac Island Ferry Sunset Cruise on Monday evenings from our St Ignace Main Dock and Thursday evenings from our Mackinaw City Dock. 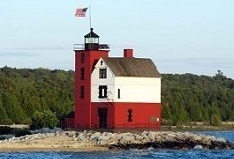 The Sunset Cruise navigates through the Straits of Mackinac and includes a narrated tour near Round Island Lighthouse, Mackinac Island, Old Mackinaw Point Lighthouse and Colonial Michilimackinac along the shore of Mackinaw City and a view of a spectacular Lake Michigan sunset under the Mackinac Bridge. Refreshments will be available to purchase before the cruise. Cruises will depart as indicated unless prohibited due to weather. 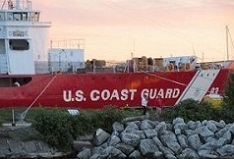 Learn about Lighthouses, the Coast Guard Cutter and more! 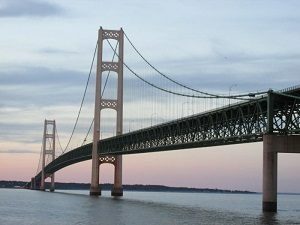 The Mackinac Bridge connects Michigan’s Lower Peninsula with Michigan’s Upper Peninsula. You may have driven across this magnificent structure, but have you ever traveled under the bridge on the water? The views from the bridge while crossing are truly wonderful, but the view from below is where one realizes the magnificent size and height of the structure and its unique architectural design.